I have been lucky enough to travel a ton lately which means this trip to Palm Springs that I went on in the middle of May now seems like a million years ago. Today is my first day back home recovering from my most recent trip and travel nightmare. Traveling can be quite the adventure at times. Anywho, I’ve been to Palm Springs once before back in September of 2016, but this trip was totally different. And even more fun! Last time I was there, we mostly stayed in downtown Palm Springs, but that was because I had no idea of everything outside of downtown. Luckily this time I ventured out into the Greater Palm Springs and got to know Palm Desert, some of the amazing hotels it offers, and some activities that are a must. I also found out that I’m REALLY good at cleaning my plate…which I did everywhere I went. And remember, I was traveling alone for this trip. I flew American Airlines direct (the best) to Palm Springs and that airport is FREAKING ADORABLE!! One of my favorite airports to date since you can have a coffee outside while you wait for your flight, all while being surrounded by palm trees. I think I’m just obsessed with palm trees since we don’t have any here in Colorado. After landing at the airport, I quickly rented a car and drove straight to a meeting spot to meet up with Red Jeep Tours. If you’re a person who loves being outdoors and taking in all the facts about the world, this trip is for you. The Red Jeep Tours guides have so much freaking information stored in those little brains of theirs. I was on a jeep with another family and we went on the San Andreas fault tour that takes you through a private Metate Ranch preserve with insane landscape of an active earthquake fault system. 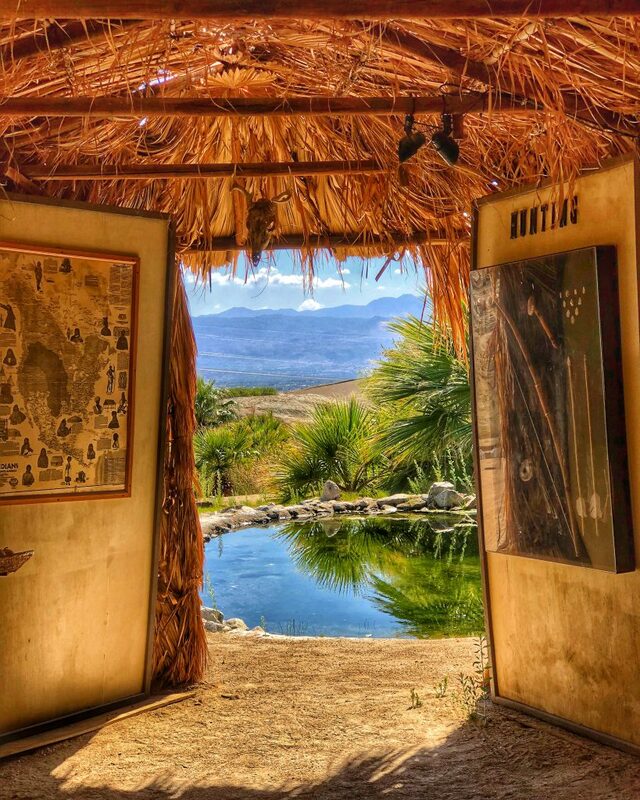 They even have an area dedicated to the Cahuilla Indians to share the history, culture, lifestyle, and legends of the Cahuilla people. I think this type of tour is a great family experience, especially if you have kids because it would be a great learning experience for them! After my Red Jeep Tour, I made my way to my hotel for the weekend, the Miramonte Indian Wells Resort & Spa. This is a large resort but with a boutique feel to it. 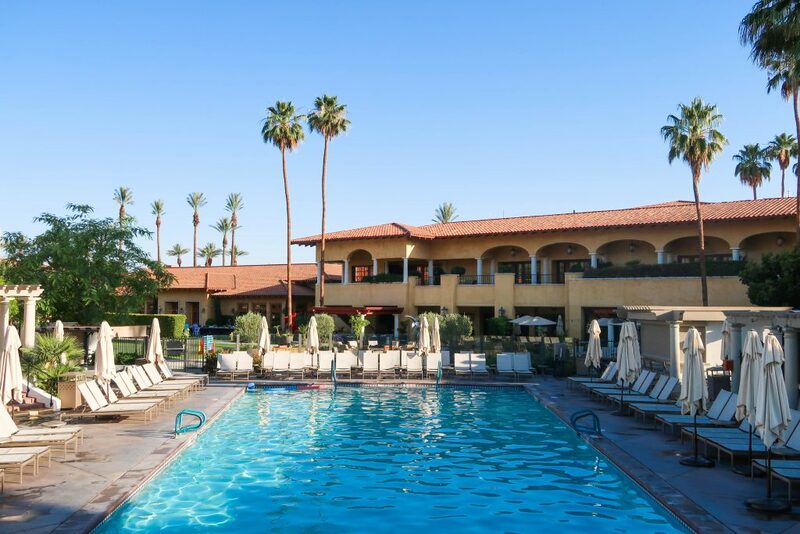 But the main reason this blog post is called Palm Springs Perfection in May their great gym is mainly because while I was at this resort, the weather was PERFECT and it was pretty calm throughout the resort since Palm Springs low season is in the summer. So everywhere I went on property, I had it mostly to myself. I was able to workout in by myself, spend time at the pool by myself, and I didn’t have a hard time getting into their amazing Citrus & Palm Restaurant. It made me want to go to Palm Springs in May every year! 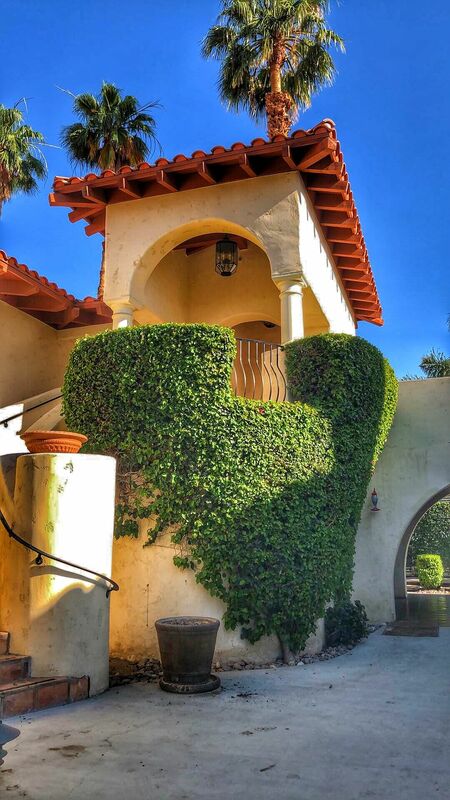 The Miramonte Indian Wells Resort & Spa offers beautiful rooms, suites and villas on property. Then as you wander around the property itself, you’ll find three resort pools featuring food and beverage service, bike rentals, two restaurants, an amazing gym, then you’ll also have plenty of grounds to hang out on in the evenings with fire pits and even games. I saw a wedding going on while I was staying there and it definitely made me think how this resort would be awesome with a big group of friends! That way everyone could rent a cabana together and hang out at the pool the entire day! But I think my favorite part of the entire resort was…surprise surprise…the food! The food was fantastic there. And after talking to the chef, it is quite obvious that he loves what he does and loves to see what people think of his food! 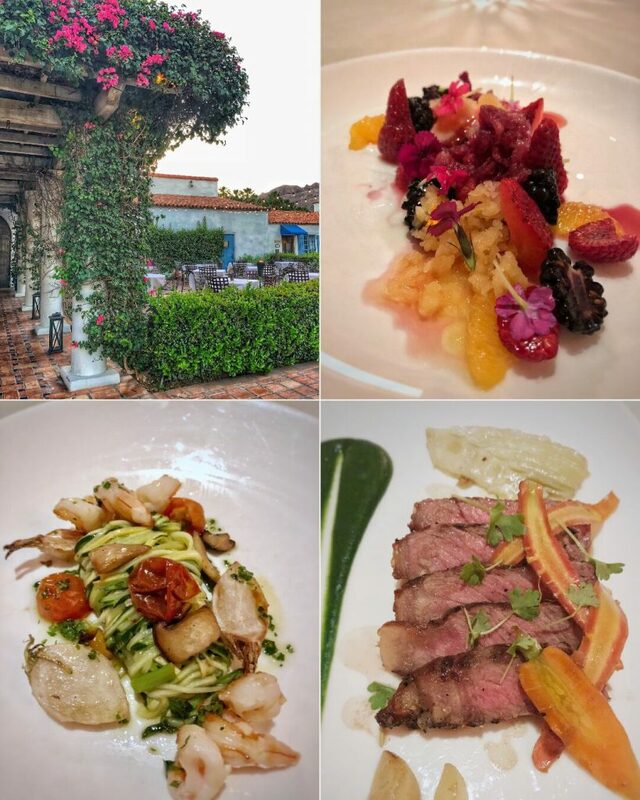 Miramonte’s Citrus & Palm Restaurant features fresh local cuisine and often utilizes items grown on property as well as sourced from local farmers! 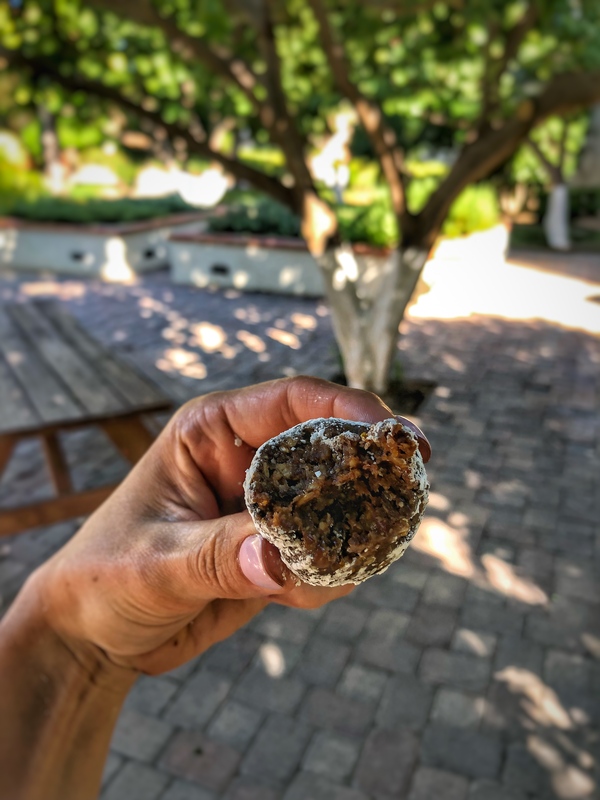 When I first arrived at Miramonte, I was greeted by THE MOST delicious energy balls, maybe ever, in my room. It was the perfect snack to kick off this quick trip. And that same night, I ate at the Citrus & Palm Restaurant and it was freaking amazing! What I love about the Citrus & Palm Restaurant’s menu is that they mark everything that is gluten free and they also mark everything that is under 1000 calories! I tried the GF roasted brussels sprouts with pancetta, honey, dijon, almonds and parmigiana reggiana. Then I snacked on the stir fried green beans with crispy pork, thai basil, mint, peanuts and sea salt…which were HANDS DOWN the best green beans I’ve ever had in my life. Then I had the Mangalitsa Pork Chop with garlic mashed potatoes, brussels sprouts and applesauce and let me tell you something…it was f*cking outstanding. Sorry to piss people off with my language, but I’m not really a pork fan, especially pork chops. They are usually dry and tough and just not that great. But this pork chop by Mosefund Farm was unlike any pork chop I’ve ever tasted. It was tender, flavorful and the perfect fat content. I can’t say enough about this meal. And since I wasn’t full enough from eating by myself that night (insert eye roll emoji), I topped it off with a Date Shake topped with toasted coconut, with dates from local Shields Date Farm. It was all SO FREAKING GOOD. I was seriously blown away! 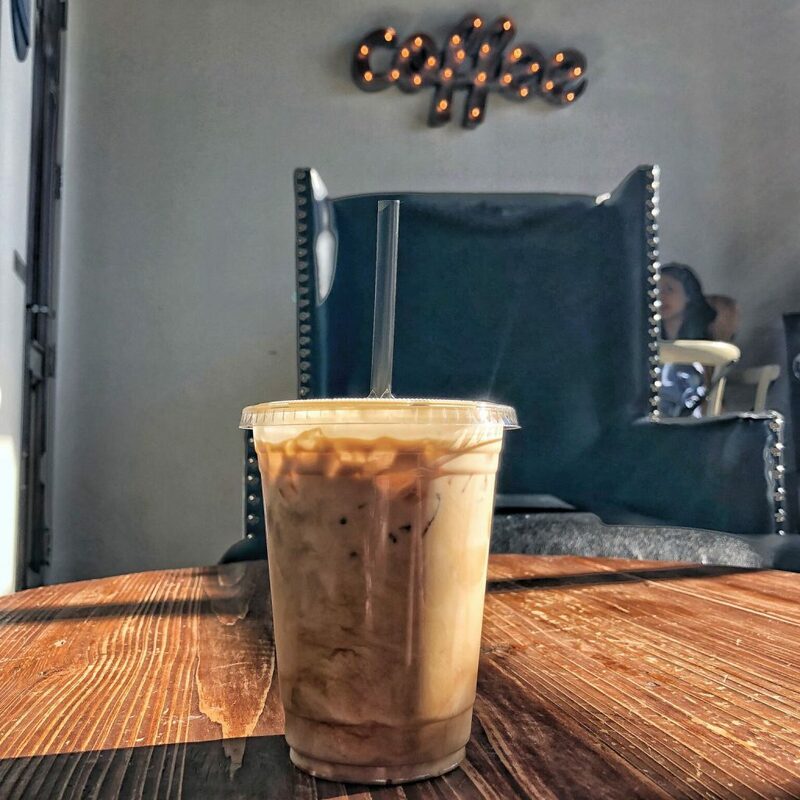 After sleeping off my food coma and dreaming about those green beans and that pork chop, I woke up the next morning and started my day off at IW Coffee. There are so many different small coffee shops in this world nowadays, but this coffee shop is a notch above the rest. IW Coffee offers fair trade, organic coffee that is made in small batches and locally roasted. Plus they have a ton of amazing baked goods, including many that are gluten free! I grabbed a gluten free blueberry muffin one day and it was divine! I loved this spot so much that I ended up going back my last day before I headed to the airport! After coffee and a muffin, it was time to get my sweat on. And if you’re looking for a great workout that will leave you drenched, look no further than Bikram Yoga Plus! You probably know that I’m not a huge yoga person if you’ve been reading the blog for a while, but I do love a fast paced yoga class and the Inferno Pilates is perfect for that! It was a full body, low impact, high intensity workout done in a room heated to 95 degrees and 40% humidity. So if you’re a person who normally wear pants when you workout (like me), you may want to switch it up for this class. I’m use to that sort of heat because our CrossFit gym is a hot box in the summertime, but you’ll definitely be feeling the heat while you’re in there. I loved this class and loved all the women who were obviously super into the instructor and the class itself. It was a great vibe and workout all in one! After an extra long post-workout shower, I made my way to Hotel Paseo to eat at their AC3 Restaurant. Since the weather was so perfect, I ate out on the patio and enjoyed views of the San Jacinto Mountains. But inside, you’ll also find quite beautiful with their bright modern interior. 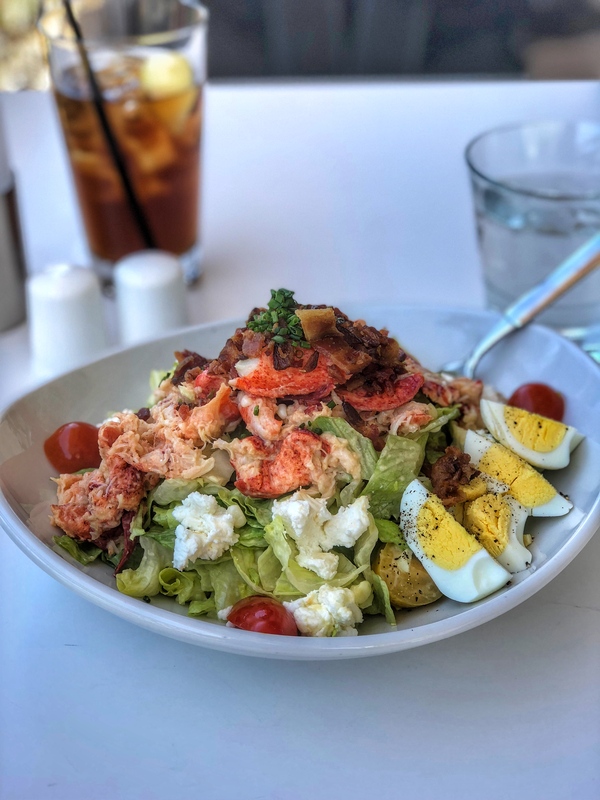 The food and drinks at AC3 Restaurant is super fresh and that was quite apparent when I order the lobster cobb. Why doesn’t every restaurant have a lobster cobb because it was FANTASTIC. On the menu, you’ll also find creative items like their blistered shishito peppers with sesame seeds and their firecracker Sauce. And they also have seafood ceviche, roasted beets with burrata, and if you’re interested in going off your gluten free diet, they have adult grilled cheese and lobster mac & cheese. I watched as many servers went by with different plates and everything looked amazing, but my lobster cobb was definitely my favorite choice. I loved it! After spending my afternoon at the Miramonte pool working on my computer under the cabana, I made my way to La Quinta Resort & Club to eat at one of their restaurants, Morgan’s in the Desert. This resort is absolutely stunning and absolutely gigantic. It offers 5 golf courses, tennis courts, a beautiful spa and salon, 7 unique restaurants, 41 pools, and it’s even a pet-friendly resort! 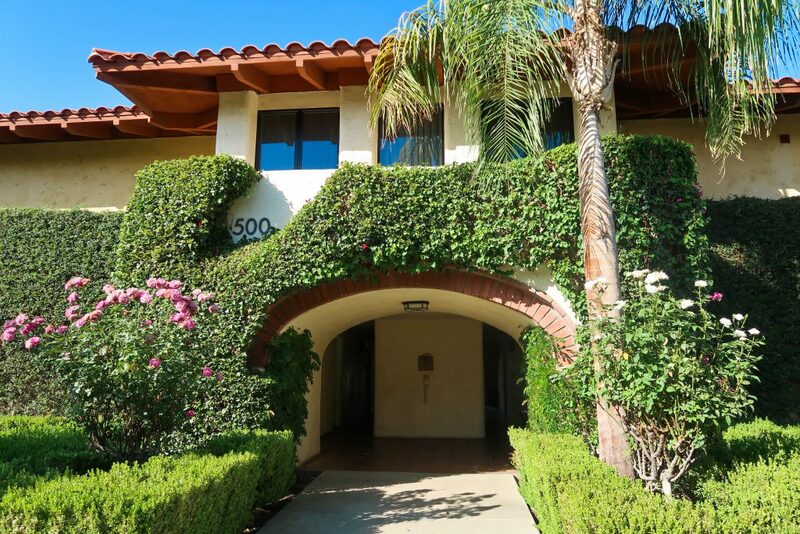 BUT it doesn’t feel that gigantic when you’re on the property because the resort features casitas which makes each space feel quaint and special. When I make it back to Palm Springs again, I plan on experiencing La Quinta Resort & Club more because I loved it and I was only there for a couple hours having dinner. But funny enough, once I got back from my trip, I had friends who told me how they stayed at that resort for their wedding and absolutely loved it! Small world! Anywho, while I was on this beautiful property, I ate at the signature restaurant on the property – Morgan’s in the Desert. 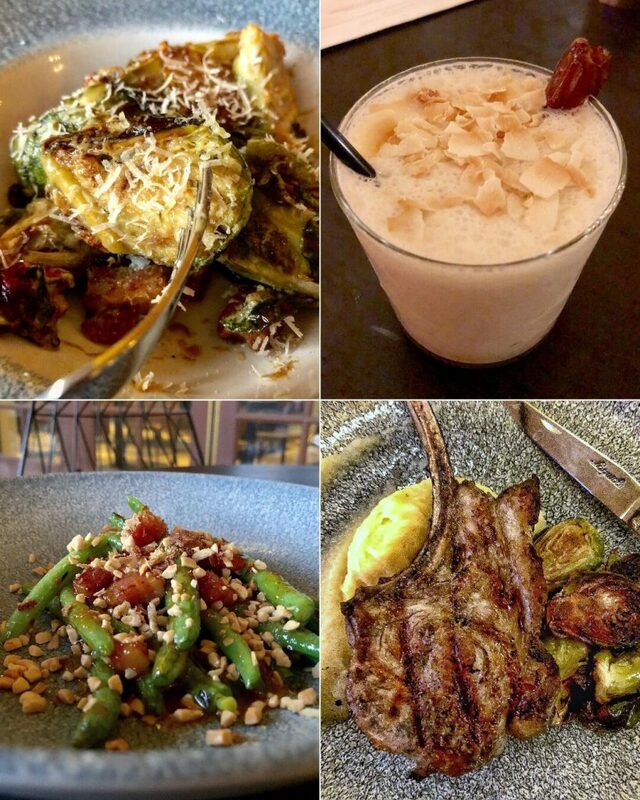 This restaurant is fresh, flavorful and incredibly creative. Most of the time when I’m traveling and trying these amazing restaurants, I leave feeling overly full and in need of a cleanse when I get home, but not with Morgan’s in the Desert. This restaurant uses clean ingredients in unique ways so you can still clean your plate but leave feeling even better than when you walked in! I had the spring papardelle made with zucchini noodles, white wine, garlic, turnip, king oyster mushrooms and shrimp, then a perfectly cooked steak with sous vide apples and pickled carrots, then a stunning fruit granita topped with honey and edible flowers. I’m not kidding – I left this restaurant feeling healthier than when I walked in. And the next morning I felt amazing. That doesn’t often happen when you eat out at restaurants, but Morgan’s uses the freshest ingredients and leaves you excited to try something new on the menu next time around! I really, truly loved this restaurant! After one last coffee at IW Coffee, I stopped by Wildest Greens for one last meal before I headed home. 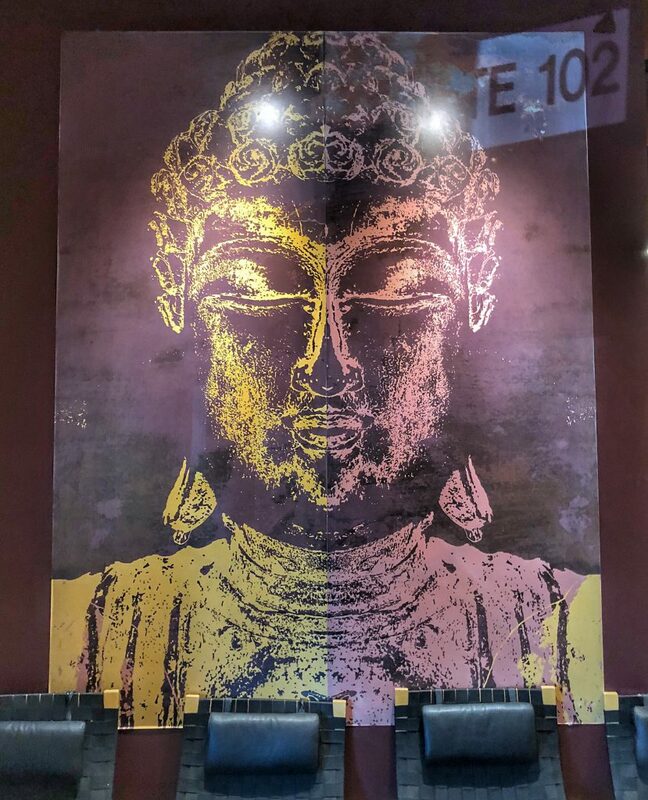 This restaurant is owned by the same woman who owns Bikram Yoga Plus, so she is obviously driven by health and improving people’s lives! This restaurant is such a freaking cool space. You walk in and you’re welcomed by color everywhere. 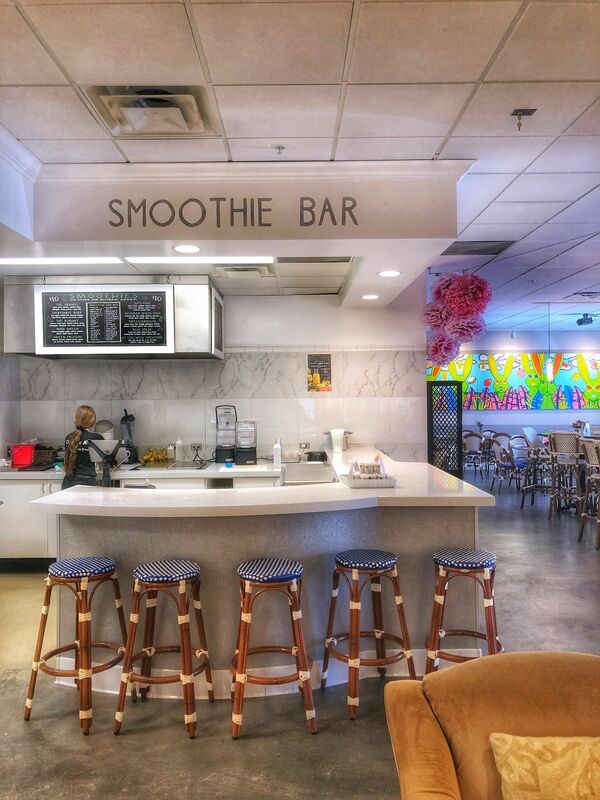 There is a smoothie bar, a coffee bar, a ‘grab n go’ corner, and a full menu that you can sit and enjoy with the whole family. And they really do have something for everyone. Whether you are paleo, vegan, gluten free or you just eat anything, they have it! And their menu is HUGE! From french toast to paleo pancakes to chia pudding, muffins, omelets, salads, bowls, burgers, sandwiches, desserts, and even freshly squeezed juices – they have it all!! I enjoyed a simple breakfast of eggs, potatoes, sausage and gluten free toast and the scrambled eggs were some of the best eggs I’ve ever tasted. I also was lucky enough to speak with the owner who told me about her family owned turmeric farm in Hawaii, which they use in many of their juices and recipes for the restaurant. So freaking cool. If you ever make it to Palm Springs, this restaurant is a must because you’ll want to bring a book or your computer and work their for hours. I can’t wait to make it back! Palm Springs is one of those places that is lovely no matter when you visit it (especially if you love the heat), but May was by far my favorite time. Everywhere I went was calm and inviting and the weather was around 85-95 degrees the entire time, but I never had a hard time staying cool. 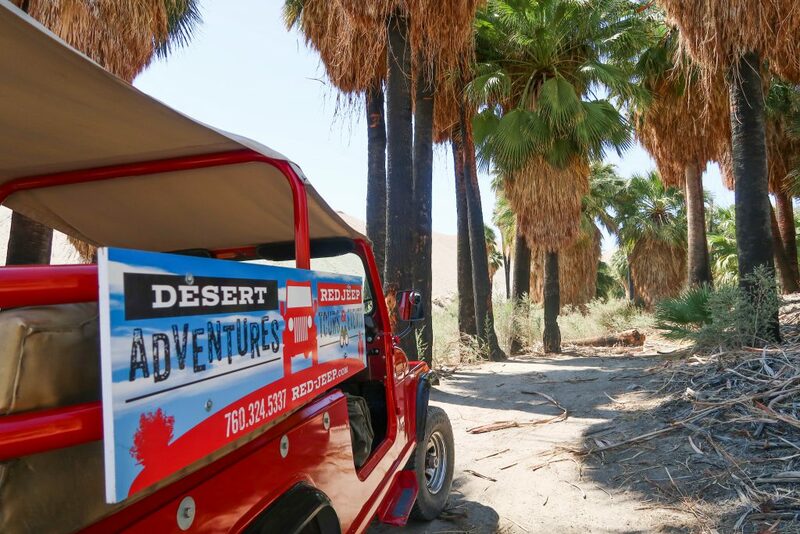 Since low season starts in May, it’s the perfect time to enjoy the nine cities that make up the Greater Palm Springs and experience a healthy vacation that will leave you feeling refreshed and rejuvenated. I seriously can’t wait to make it back and visit even more delicious places! 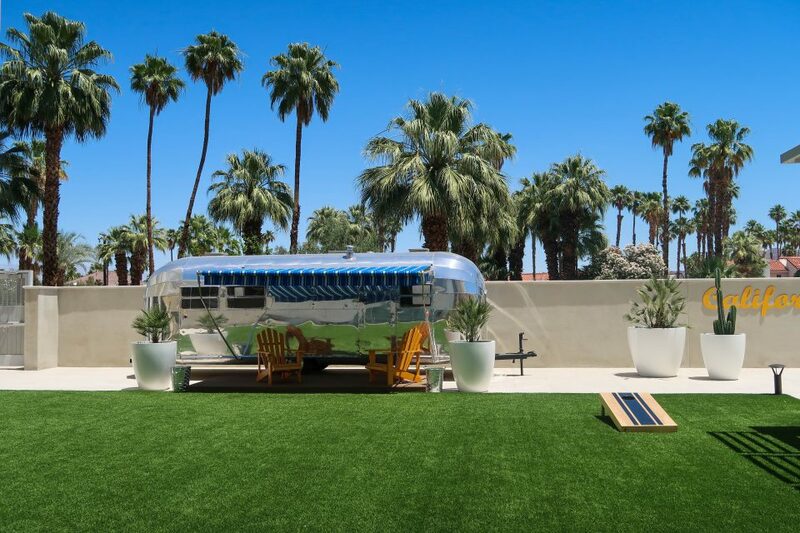 Hope this helps you plan your next trip to Palm Springs! And be sure to leave a comment with things you’ve loved to do when you’ve been in Palm Springs! This trip was hosted by Visit Greater Palm Springs, but all opinions and experiences are my own! WOW, this place looks incredible! I’d never considered going there before, but I’m definitely going to consider it for future trips. Great job, Juli! are you planning on trying to remake those energy balls? i have zero clue what was in them. but i already have many energy balls on my website to choose from! I live in the desert (in La Quinta, the town just southeast of Palm Desert), so it’s so fun seeing you write about where I live and your experience here! I’m so glad that you had such a fabulous time. I absolutely love living in the desert, and I totally agree that Palm Springs airport is the cutest and best airport for flying into and out of. Also the palm trees make me feel like I’m on perma vacation :) One super cool thing about all the restaurants, resorts, and even gyms and yoga/pilate studios here is because summertime is off season, there are so many specials and discount offers of things for locals. Love them desert perks! Excited for you to come visit again and explore even more!! love it there!! la quinta was so beautiful! Your trip looks awesome!I went to Palm Dessert for a work conference a couple years ago in May and thought it was great that there weren’t that many people around, and it wasn’t too hot. While I basically never left the resort the conference was at, my favorite part was walking around and seeing the mountains there, which were very pretty and cool for me to see (I live in northern Michigan so I am not used to mountains, unlike you in Colorado lol). And I really want to go back and check out the Joshua Tree National Park sometime – probably in May – and now I know some good restaurants to try, thanks! it’s so stunning there!! i definitely want to make it to joshua tree too! First time to Palm Springs at the end of October- would you recommend staying at The Monkey Tree or Miramonte? I know you enjoyed both places, but I’m having a hard time deciding which location is better for our first visit out there. We like to do activities/workout/tour during the day but also enjoy lounge time at the pool. What do you suggest? Thanks!